By 2050, if considerable gains are not made to combat AMR, it could become the main cause of death among all diseases worldwide. In addition to promoting and fostering R&D for AMR-related health products and taking a strong stand on environmental responsibility, promoting and supporting appropriate stewardship to enhance conservation of anti-infectives is crucial. An educational game to understand differences between bacteria and viruses, implications of AMR and the importance of preserving currently available antibiotics. A free and fun-to-use digital tool to reach a large proportions of the general public (especially teenagers and their parents). A tool for Health Care professionals (HCPs) to educate their patients on the “appropriate use” of antibiotics, from an early age. The strategy is to target children and teenagers to educate them about the “good use” of anti-infectives. The expected result is to raise awareness on the issue of AMR among the general public, beginning in childhood and following through into adulthood and on to parenthood. Sanofi invested 150.000€ to develop and promote this game in 2017. 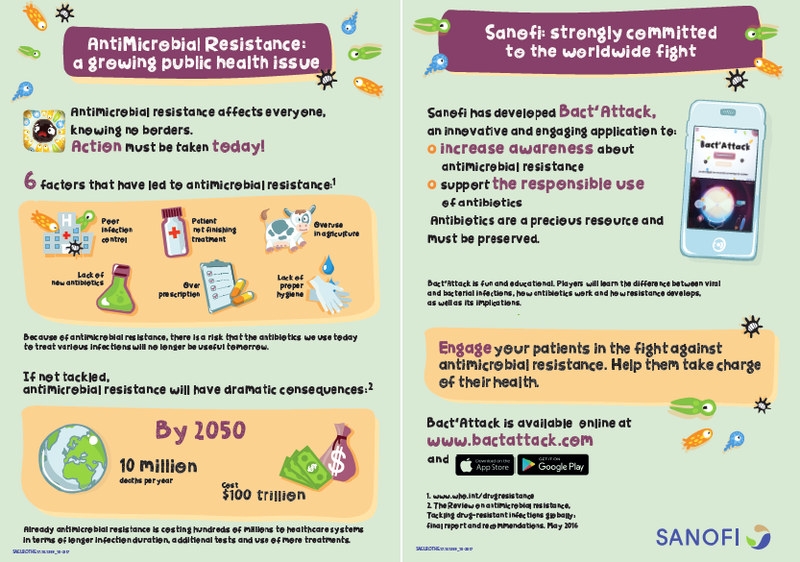 Sanofi’s ambition is to make it a reference game helping to raise awareness of the profound issues of AMR for HCPs and other stakeholders. The application was developed through a collaborative approach, with testing and evaluation by a French patient panel and validation through an exhaustive survey of French patients. Additionally, content was developed in partnership with French ID experts from SPILF (French academic medical society). One and a half months after launch, the application has had 13.000 downloads in stores (iOS or Android – France). The innovative, useful and fun application has had a large reach so far and plays an important role on educating the population on AMR.